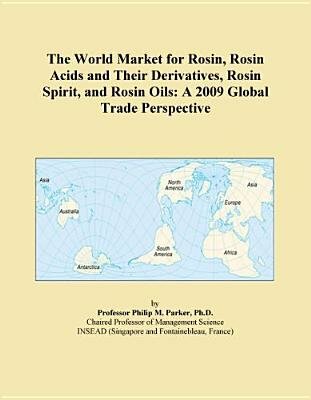 This report was created for strategic planners, international executives and import/export managers who are concerned with the market for rosin, rosin acids and their derivatives, rosin spirit, and rosin oils. With the globalization of this market, managers can no longer be contented with a local view. Nor can managers be contented with out-of-date statistics that appear several years after the fact. I have developed a methodology, based on macroeconomic and trade models, to estimate the market for rosin, rosin acids and their derivatives, rosin spirit, and rosin oils for those countries serving the world market via exports or supplying from various countries via imports. I do so for the current year based on a variety of key historical indicators and econometric models.On the demand side, exporters and strategic planners approaching the world market face a number of questions. Which countries are supplying rosin, rosin acids and their derivatives, rosin spirit, and rosin oils? What is the dollar value of these imports? How much do the imports of rosin, rosin acids and their derivatives, rosin spirit, and rosin oils vary from one country to another? Do exporters serving the world market have similar market shares across the importing countries? Which countries supply the most exports of rosin, rosin acids and their derivatives, rosin spirit, and rosin oils? Which countries are buying their exports? What is the value of these exports and which countries are the largest buyers?